If you’ve listened to much of my training, when it comes to showing you how to find affiliate products to promote quite often I personally refer to the Clickbank Marketplace. The reason I do this is because Clickbank approves virtually everyone (unless you are from Nigeria or some other country outside their approval zones), and they have an amazing selection of products to promote with high commissions. The other reasons are because most of the money that I make comes from Clickbank and also because they are extremely reliable with their on time payments, and I’ve built up a good relationship with them over the years. However, in this blog post I want to share with you a list of other alternatives for you to consider as I don’t want my own bias to prevent you from seeing that there is a whole world of affiliate offers to promote outside of Clickbank. I think joining all 10 of these will be overkill, but billions of dollars in transactions are being made every year through these other networks, and many have fantastic offers that are not available at clickbank. I have several affiliate millionaire friends who earn the majority of their income outside of Clickbank, and you may find some of these networks very useful to join. ​Rakuten LinkShare has a lot of physical products to promote, including some big-brands. It’s not the fastest to sign-up to, or the simplest to navigate, but there’s a lot of helpful guidance as you go. You have to sign-up with each individual advertiser before you can promote their products. This draws out the process, but also demonstrates that higher-quality is important here. You can find more information comparing Rakuten LinkShare and Clickbank here. CJ Affiliate is like Rakuten Linkshare in that you have to apply to individual advertisers, which takes more time than the instant acceptance of many other networks (such as ClickBank). However, it’s usually not too difficult to get accepted by most advertisers here; you just have to be a legitimate marketer with ethical practices. It’s easy to filter the products here by category, serviceable area, language, currency etc… This makes it very convenient for you to find the best products to promote quickly and painlessly. CJ Affiliate has a very large variety of products to promote. If you’d like to know exactly how to use CJ Affiliate by Conversant, check out the guide in our free lessons here. Learn more about how CJ Affiliate compares to ClickBank here. It’s simple and easy to sign up for ShareASale, but it’s not the most straightforward platform for navigating the available features. Search for merchants using the “Merchants” icon at the top, then “Search for Merchants”. You can then filter via keyword, category, or a mixture of information in an advanced search. It’s not easy to get started joining affiliate programs. You have to verify that you own your website before you can join any of them, which involves placing a key in your website’s header tag. A bonus with ShareASale is being able to add products to your “basket,” which means you can save information about merchants or products that you’d like to apply for, review, or export later on. There is quite a wide variety of both physical and digital products on this network. Find out more about how ShareASale directly compares to ClickBank here. If your website topic is anything to do with the health niche, then this could be a really great network for you to use. Check out the full lesson for more information on Market Health and how it compares to ClickBank. Neverblue is a very well respected CPA, or cost-per-action, network. This basically means you get a commission when people go and perform an action, such as signing up or entering details into a form. The trickiest thing about Neverblue is getting accepted. The site is very careful about the potential for fraud and will do a check on everyone before accepting them. In saying that, if you’ve got nothing to hide, just be honest and you’ll be fine. The site offers a wide variety of opportunities to choose from, and it’s known for paying correctly and on time. Find out more about how Neverblue compares to ClickBank here. 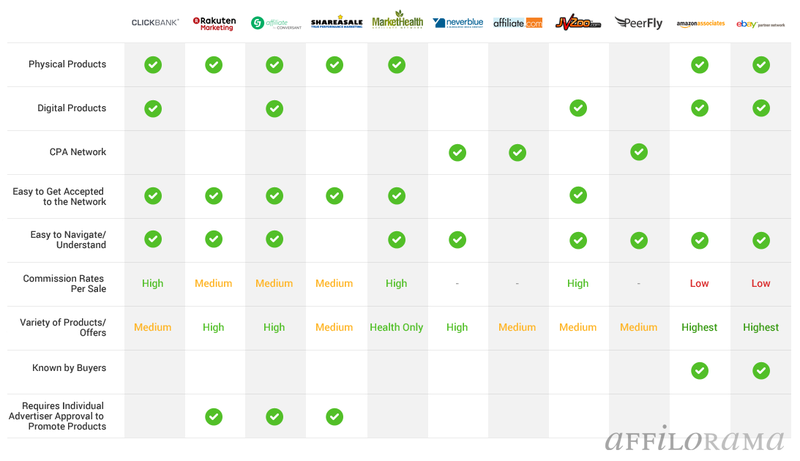 Affiliate.com tends to prefer intermediate to advanced affiliates, so if you don’t have much experience yet you’d probably be best to try one of the other networks first. To sign up with the site, you have to fill out an affiliate application, which the site will review within 2 business days. You’ll get a call to confirm all of your information and be assigned to an affiliate manager. Check out the free lesson to see how Affiliate.com directly compares to ClickBank. JVZoo is very similar to Clickbank in that it’s a network for affiliates and sellers based around digital products. It’s easy to navigate, and, just like with Clickbank, you can check out the marketplace to get an idea of the products you could promote before you’ve even signed up. There are a lot of less-than-ideal affiliate programs on this network however. Some have terrible grammar mistakes or poorly-executed sales pages. This doesn’t mean that you can’t succeed with JVZoo, it just means you have to carefully filter through the products before you decide to promote something on your site. This is true of any network, but especially important here. Go to the full lesson to see how JVZoo directly compares to ClickBank. This verification process is a really good thing, even if it takes a little more time and effort. It means that if you do get accepted, you’re in good hands. Find more information about how PeerFly directly compares to ClickBank here. The well-known name of Amazon means that there’s a strong level of trust associated with buying from this network. This works in your favour when you promote the products here. The downside here is that the commission rate is tiny, you have a much smaller window in which to convince people to buy (only 24 hours) and it’s hard to get approved by the network. Ideally, you need a website which already has a healthy level of traffic to get accepted, and to make it worth your while. Check out the full lesson to see more about how Amazon Associates compares to ClickBank. eBay Partner Network is a very similar story to the Amazon Associates network. There’s a huge amount of products available for you to promote, and you get the added advantage of eBay’s credibility: People know that it’s safe to buy from eBay. Check out the full lesson to learn more about how the eBay Partner Network directly compares to ClickBank. If you haven’t found what you’re looking for with Clickbank previously, I’d try using the gravity filter to find the best niche and products for you before giving up. You can find a guide on how to get the most from Clickbank here. There are many other networks than the ones that I’ve listed above, but these are the ones that either I know others are being hugely successful in, or I have met personally with the networks and know of the quality of their organization and offers. I’m interested in your comments, so let me know of your own experiences and opinions below.